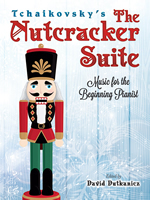 Novice pianists will take pride and pleasure in performing selections from The Nutcracker Suite with this simplified beginner's score. Tchaikovsky's ballet was an instant success upon its 1892 debut, and it remains a perennial holiday favorite with music lovers. The ballet score proved so popular that the composer was compelled to arrange eight selections into a suite for orchestras to play without the accompaniment of dancers. This collection features Tchaikovsky's entire original suite, which includes Dance of the Sugar Plum Fairy and Waltz of the Snowflakes, as well as two extended arrangements, March and Russian Dance. As a special bonus, five selections from the ballet that the composer omitted from the suite appear here. Most of these pieces are accompanied by brief notes from the editor with performance suggestions.